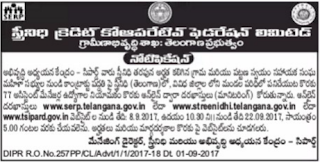 for this job can apply through online website of SthreeNidhi Telangana www.serp.telangana.gov.in/ www.streenidhi.telangana.gov.in/ www.tsipard.gov.in. This Recruitment link activates from 11-06-2018 (10.30 AM). Closing date to submit filled application is 30-06-2018 by 5.00 PM. Application fee for general category is Rs. 300/- and Application fee for ST/ SC candidates is Rs. 150/-. See the Notification for Salary, Qualification details visit SthreeNidhi notification. Minimum and Maximum age limit for the current recruitment are 25 years and 40 years. Selection of applicants for the Assistant Managers Jobs is based on their performance/ skills in written exam and Interview. Please follow the below given information of Age limit, Relaxations, Salary, Qualification, Application Procedure, Method of Selection, Application fee of SthreeNidhi Credit Cooperative Federation Ltd, Telangana Assistant Manager Jobs Recruitment notification. To get salary details please check the Telangana SreeNidhi Official website. 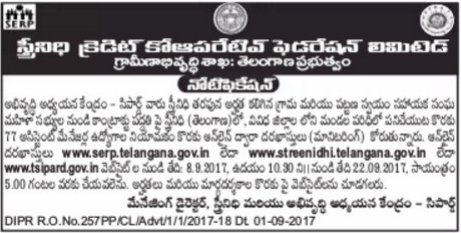 Please go through StreeNidhi Telangana official notification to get educational qualifications for the selected post. Minimum age of the individual to apply for the current recruitment is 25 years and maximum age should be 40 years for Assistant Manager Jobs. For Manager jobs age limits are 28-35 years. Selection of applicants for the Assistant Manager Posts is based on their performance given in written exam and/or Interview. Interested candidates log on to the official website www.serp.telangana.gov.in or www.streenidhi.telangana.gov.in or www.tsipard.gov.in. Search for desired job and open the application. Read the instructions to fill all entries in application. Attach necessary documents and submit complete application form. Take the printout copy for future use. Application online link activates from 11-06-2018. Last date to submit filled application is 30-06-2018. Follow the Notification for More details regarding application Procedure.